Right angles—perpendicular intersection of surfaces and lines—apply to many things such as manufacturing, agriculture, civil engineering, and architecture. There is an array of terms utilized to explain this relationship, including squareness, normalcy, 90 degrees, and perpendicularity. When it comes to engineering products, some of them do not feature perpendicular surfaces. In this case, perpendicularity when engineers and technicians need to create dimensions via rectangular coordinates. In the manufacturing industry, the measurement and implementation of right angles are never perfect. It is whether you achieve a higher degree of perpendicularity or not. Before we talk about using air gages, let’s first understand how perpendicularity is measured or inspected, as well as what the better alternative is. Comparing the workpiece to a master square is one of the most common methods for inspecting perpendicularity. Master squares can be made from ceramic, granite, or steel. You can certainly speed up the process of checking perpendicularity with an electronic height gage. Although these gages do not have the usual level of mechanical perpendicularity that’s often found in precise master squares, they are still very repeatable gages. Due to its repeatability, any inherent inaccuracy can be corrected or measured for. If you are checking for perpendicularity that’s over four inches or 100mm, height gages and master squares will suffice. If you are measuring shorter lengths, e.g. the hole (its diameter) to a face are of the same lengths (about 25.4mm or one inch), the aforementioned tools may be too bulky to work with. This is where air gages come in. How is Air Gaging Relevant? Air gages allow you to put multiple measuring locations in tight areas. So, apart from measuring diameters, you can configure air plugs and platens to measure perpendicularity (mostly from inside out). You should keep in mind that air gages designed to measure squareness are slightly different. How so? These gages are typically manufactured to a very high tolerance. In addition, the air plug is square to the platen. Next, the accuracy of the squareness plug is built into the air gage. The air tooling then becomes the master. Finally, it features two built-in air jets that are installed at different heights. It is important to note that the air jets only measure over the distance between them. In other words, they cover approximately 80 percent of the total length. The tolerance of air gages would be 0.0008″ most of the time. That’s why you should ensure the accuracy of the squareness measurement by paying close attention to the actual gaging tolerance. If the air jets and part’s length are close, the tolerance will be tighter. Set two air jets at different heights and at 180 degrees. 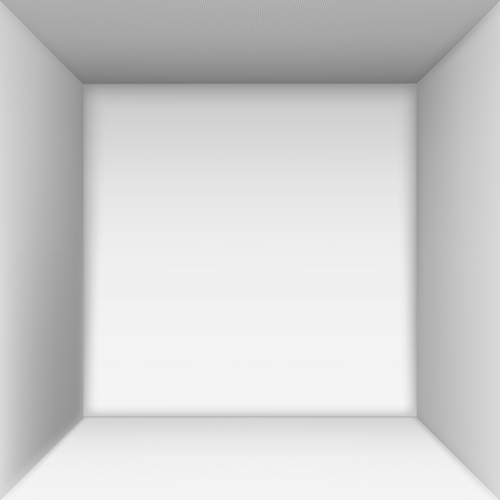 You can use this method to compare out-of-squareness. 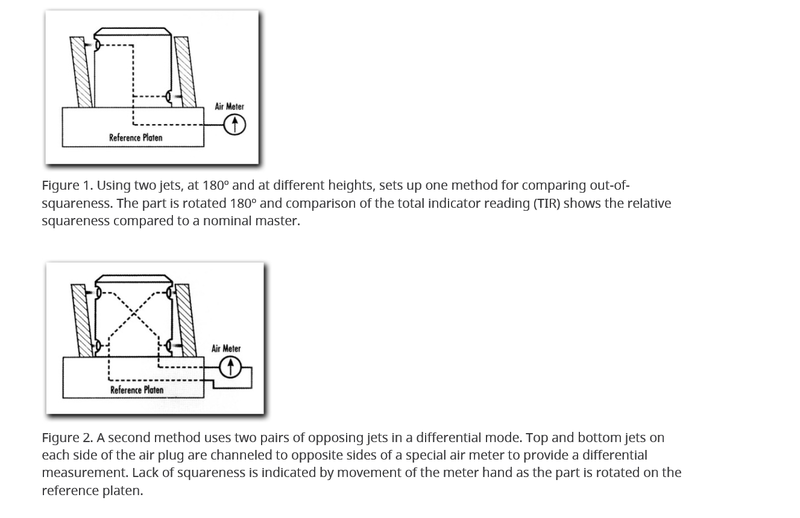 Simply rotate the part 180 degrees, take note of the total indicator reading (TIR), and then compare the TIR to a nominal master. You can set two pairs of opposing air jets in a differential mode. Channel the top and bottom jets, on each side of the air plug, to opposite sides of any special air meter you are using. Rotate the part on the reference platen and notice the movement of the meter hand (check if there is a lack of squareness).